Displayed improved version of the previous "Plate Mounter" and a small-volume "Cartridge type ink circulation device" newly developed. The plate mounter is planning a demonstration operation, so please drop in by all means. We also exhibited aqueous film print samples. We replaced the plates at "Plate Mounter" and printed on the CI flexo printing machine "WATERGREEN". We will exhibit film print samples. · Automatic alignment function installed. Positioning of the printing plate with high precision and speed is possible. · Equipment to remove the plate and cushion tape. · Cut the cushion tape at an ideal 45 ° angle with the slide cutter. Suppress the bulging of the tape joint. We are planning demonstration operation of actual machine. Please do not hesitate to speak to an explanator. Can be installed close to the doctor chamber, circulating a minimum of ink in a 5 liter tank. 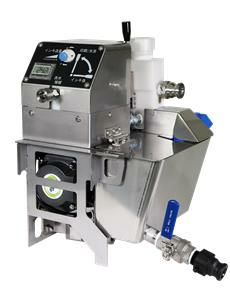 2kg ink tank can be easily removed from 14kg equipment.